The sky from mid-northern latitudes at 5:30 a.m. on April 15, 2007. A new comet has recently been discovered, and like the brilliant Comet McNaught from earlier this year, this latest discovery belongs to an Australian: Comet Lovejoy (C/2007 E2). On March 15th, Terry Lovejoy of Thornlands, Queensland, Australia, discovered a 9th-magnitude comet in the southern constellation Indus the Indian. In reporting the find to the Central Bureau for Astronomical Telegrams (CBAT), in Cambridge, Massachusetts, Lovejoy described the comet as having a coma that appeared distinctly green in color, with a slight extension to the southwest. Remarkably, Lovejoy made the discovery not with a telescope but using an off-the-shelf digital camera! In fact, it appears to be the very first case of the discovery of a comet discovered in this manner. Lovejoy was using a Canon 350D with a zoom lens set to 200-mm focal length at f/2.8. Lovejoy spotted the object near the frame edge in 16 exposures of 90 seconds each. The images were obtained during a comet-hunting survey that Lovejoy has been conducting for more than two years. The first independent confirmation was obtained by John Drummond (Possum Observatory, Gisborne, New Zealand) on March 16. He used a 41-cm reflector and visually estimated the magnitude as 9.5-about 15 times dimmer than the faintest sky objects that can be seen without optical aid. Drummond estimated the coma diameter as 2.6 arc minutes (roughly equal to about 1/12 that of the apparent width of the Moon). The green comet is too dim to see with the naked eye, but it's a nice target for backyard telescopes. The first official orbit was calculated by Brian G. Marsden of the CBAT on March 19. He took 36 precise positions spanning a three day interval and determined the comet's perihelion date (when it will sweep closest to the Sun-a distance of 101.3 million mi/163 million km.) as March 27. The comet's distinctive greenish hue seems to suggest that it is rich in cyanogens and diatomic carbon. 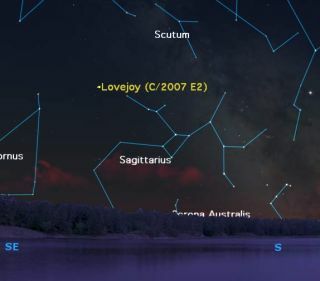 Unlike Comet McNaught, which took a southerly route after passing the Sun, Comet Lovejoy will be progressing north during April and will soon become favorably placed for observation for observers in the Northern Hemisphere. Also unlike Comet McNaught, Comet Lovejoy will (unfortunately) not become a naked-eye object; it probably will get no brighter than magnitude +7.5. That's still about two and a half times fainter than the faintest naked-eye star. But it still should continue to be an interesting object to follow with binoculars and small telescopes as it moves north during April. For most northern observers, it will not be until the second week of April that Comet Lovejoy will emerge from out of the dawn twilight and be positioned low in the southeast sky. It will be located between the constellations of Capricornus the Sea Goat and Sagittarius the Archer [sky map]. During April 20-25, the comet will appear to cross the Milky Way while passing through the southern half of Aquila the Eagle. This is also about the time when it will be passing closest to Earth (41 million mi/66 million km, Apr. 24-26) and should appear at its brightest. Toward month's end, it will glide between Lyra the Lyre and Hercules, and appearing to pass almost directly overhead at around 3 a.m. local daylight time. On Comets ml-an Internet forum dedicated to the discussion of comets, Terry Lovejoy posted his thoughts after he made his discovery: "After a very intense search effort in 2006 without success, I had wound back my efforts in 2007 (partly because of fatigue!). March 15 was only the second time this year I had done any searches in the morning sky. All told I estimate I have examined about 1000 image fields since late 2004, which would equate to about 1000 hours. 2007 has been a good year with two lifetime astronomy goals finally achieved. The first goal was to see a daylight comet (McNaught) and the second to discover a comet."